which alone can sanctify our hearts and minds. and let sin have no power over us. we may obtain our daily bread. through Christ Jesus, our All in all. This entry was posted in Uncategorized and tagged prayer by alivingpencil. Bookmark the permalink. Did you get out of the car to take this pic? I haven’t seen the fallen horse, but I was feeling very *Reeish* when I took this photo. It was on 27 miles of unplowed (unploughed in Britain) highway. As we came up on the deserted road the horses ran to the fence. 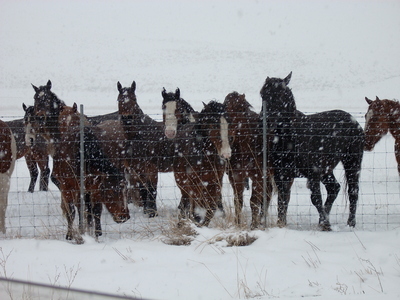 I suppose they thought we were the feed truck…And I was secure and warm when the picture was taken. Artistic care has its limits!About posts ahead of time: DO TELL! I’d love to know that. Hate to say it, but I wish I had started on blogger. Thanks,CarolPS – I was hoping to catch up, finish and post on the Hazlitt book today. However, I’m grandson sitting and that takes priority. That is a nice bunch of horses. In other news, our neighbors still have all their Christmas decorations up – and lit. They have lighted reindeer, but no inflatable things. @magistramater -I go ahead and start a new entry, writing whatever phrases or ideas come to mind for that topic, esp saving links. Then at the bottom of the dialog box, below where we chose a book we’re reading, there’s a *Status* box. Mine using is set on *public* When I change it to *private*, then only I can see that entry and it has allowed me to work on posts ahead of time. A definite plus. Previously, I would just save my thoughts on a Word document and cut and paste. Still I can do that, but this way is slightly more convenient. Have you taken the time to save any of your archive on disks? Wildflowersp, I’m be gnashing my teeth if you still had inflatables to view. At least, IMHO, lighted reindeer is a step up. We have so many hungry (live but not lighted) deer, that it makes the idea of phony reindeer in the lawn ludicrous. Carry on, my friend. They must come down sometime!Dana, thank you. I’m sure other people will appreciate that you replied instead of messaged!